In the modern world of business, it’s no longer a question of doing business without technology, but rather how technology can work best for business. To learn more about technology’s ever growing impact on business, we invite you to join us Wednesday, May 16th at Airbnb, 888 Brannan Street, for a night of dinner, drinks, and networking at Tech After Dark (#TechAfterDark). Coinciding with Small Business Week in San Francisco, the event will connect business owners with experts from some of the city’s most prominent tech companies—including sf.citi members Airbnb and Postmates, as well as Square—to discuss how businesses can leverage innovative technology to expand their markets and profits. During the latest installment of sf.citi’s Lunch and Learn series, sf.citi members gathered at Optimizely to hear Board of Supervisor candidates Christine Johnson (running for District 6) and Rafael Mandelman (running for District 8) discuss their visions for San Francisco. Both covered hot-button issues in San Francisco, engaging members on homelessness, housing, and transportation. Question for the candidates: What are your thoughts on the future of tech in San Francisco? Could these candidates be your next supervisor? Look up your district here. Want to converse with influential San Francisco policymakers and candidates in future Lunch and Learn discussions? Become an sf.citi member today! FUTURE GRADS: OFFERING HANDS-ON EXPERIENCE WORKING WITH AND LEARNING FROM COMPANIES LIKE YOURS! Last year, a number of sf.citi members and nonprofit partners hosted San Francisco high school students as summer interns through sf.citi’s Future Grads program. The 2017 cohort honed a wide variety of skills, from data analytics at ShopChat to solutions engineering, IT, and business development at AdRoll to fundraising and outreach at Techtonica. All of our student participants agreed that their Future Grads experience was a great way to learn about different industries and master new expertise. sf.citi is calling on our members to continue the tradition this year by participating in the 7th edition of the sf.citi Future Grads program. In partnership with the San Francisco Police Department, Future Grads provides local high school students with a seven-week, fully paid internship at sf.citi member companies—funded entirely by sf.citi! 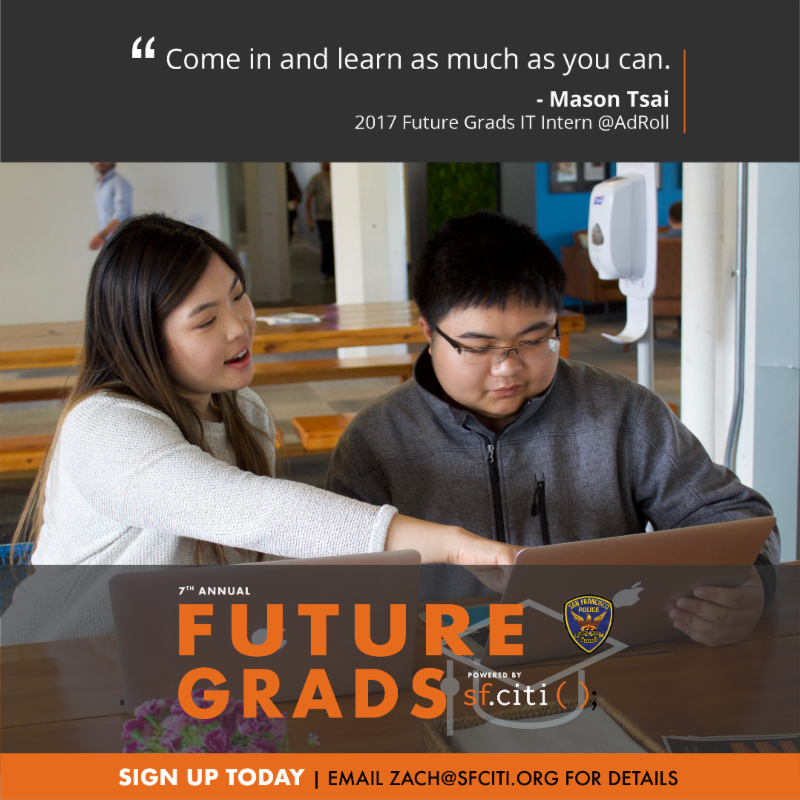 Help us build the next generation of tech talent in San Francisco and sign up for Future Grads by emailing zach@sfciti.org. sf.citi updated our website! More user-friendly, this website revamp provides a more detailed look at sf.citi’s past and current work – check it out here. sf.citi is also redesigning our newsletter – stay tuned for more changes in the coming weeks. Have suggestions? Let us know!